Part 1: A detailed consultation, discussing your history and health goals. We require you to complete our new patient forms prior to your first visit. Discussing your health history allows us to thoroughly understand your health status and direct our examination accordingly. Vital signs will be taken by one of our trained staff members. Part 2: A thorough physical examination will be performed by one of our doctors. Spinal position, curvature and muscle tone will be examined as it relates to possible spinal problems. Orthopedic tests will likely be performed to further evaluate different areas of your spine as relating to your primary complaint. A neurological examination of sensory function and reflexes will also likely be performed to further evaluate possible contributing factors. Part 3: Spinal x-rays may be taken but will be determined on a patient by patient basis. 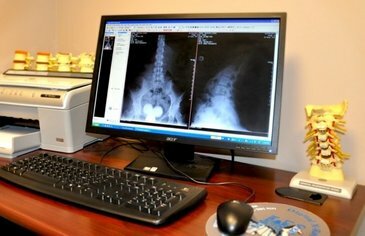 Imaging gives our doctors important information including the position and the quality of the spine, and safety considerations for chiropractic manipulation. X-rays also tell us the relative length of time dysfunction may have been present in your spine. It is important to note that this examination helps us better understand the dysfunction going on in your spine. It also gives us a baseline for future tests so we can accurately measure your progress. With this information our doctors can make a more accurate determination of the type of treatment(s) your body needs, as well as the ongoing frequency of your care. Any imaging and treatment options will be explained to you in detail by the treating doctor. The doctors will give you a care plan and go over any special instructions you will need to obtain the best possible results from your care.